CCI Logistics maintains over 150,000 square feet of public and contract warehousing space centrally located in Wallingford, Connecticut with convenient access to I-91, I-95 and I-84. We are ideally located to service the Northeast Corridor of the United States and Canada, North America and the world. We offer pick and pack, shipping services, logistics management, and innovative fulfillment services. We receive and unload import containers for storage and distribution services for a variety of domestic and international accounts. We’re very close to Amazon’s North Haven, CT distribution & fulfillment center. Being within 4 miles of the new Amazon center in North Haven we are easily accessible to suppliers in need of warehousing with optional fulfillment services. 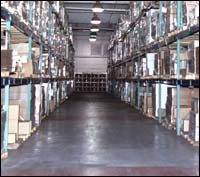 We offer warehousing space within a modern, sanitary, high cube distribution center. Contact us for more information!